Annual Sales: over $16 million. Plant 1: Asheboro, NC, off I-73 on Hwy. 220, 52,000 Sq.Ft. Plant 2: Seagrove, NC, off Hwy 705: 90,000 Sq.Ft. Injection Presses: 22 ranging from 33 Ton to 720 Ton, including 12 all electrics and hybrid. Other lines: 2 brush making lines. 2 hot melt glue lines. Secondaries: Hot Stamping, Pad Printing, Ultrasonic Welding, Fusion Welding, Machining, Assembly, Sublimation printing. Ownership: JBDJ, LLC (Lail family) and Sapona Manufacturing Co. Inc. 50/50, privately owned, financially strong. Certifications: ISO9001:2008. UL Molder. Qualify as small-business concern per US Code Title 15 Chapter 14A. Qualifications: Two team members are RJG certified Master Molder II, one Master Molder I. Fully integrated custom enterprise resource planning and lean manufacturing execution system. Materials: Wide variety of materials processed including PP, PE, PVC, PC, PA, ABS, TPE, PBT, PSO, POM, PS as well as various engineering grades, blends and additives such as flame retardant, glass filled, colorants and blowing agents. Recycling: Purchase over 600,000 Lbs/Yr. of recycled reprocessed plastics. PARTNERS! 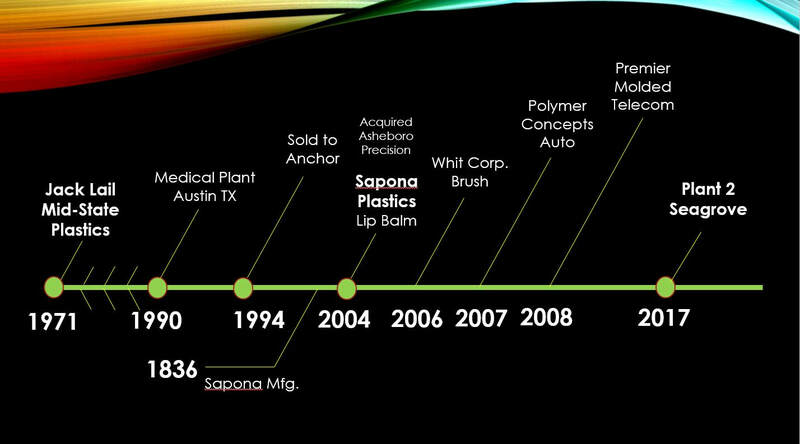 Sapona Plastics is a joint venture between Sapona Manufacturing and the Lail family, previous owners of a very successful molding business in North Carolina. It's a great combination of financial strength and plastics experience. But most importantly, it's a great partnership with you the customer. FAST! Modern electric and hydraulic injection molding presses ranging in size from 55 to 720 Ton insure consistent production. Multiple high speed assembly machines and robotics handle complex jobs. Secondary process and packaging capabilities are designed to meet each customers requirements. Quick response is provided with experience and resources to meet most any need from design to distribution. We are centrally located on the East coast at the center of the nation's 2nd largest interstate highway network. Plus we operate 24 hours a day so you can sleep soundly knowing we'll have your order to you on time. RELIABLE! You can trust our quality because our processes are compliant with cGMP and ISO 9000 quality system standards and we have highly trained personnel, including formerly certified quality engineers, technicians, and auditors. We pride ourselves on honesty and integrity. You can be confident that significant changes will not be made without your approval, and we will do what we say or we'll let you know immediately. LOW COST! Sapona Plastics' philosophy is to provide service and value to our customers. We back this up with highly efficient manufacturing operations and very attractive pricing. Recent machines added are all electric machines which run faster and use as much as 25% less energy. North Carolina is a right to work state and the region's labor pool is the 10th most cost effective in the nation. Our power reliability and cost are among the nation's best, and we achieve even lower rates through our peak shaving program. Our maintenance program keeps molds in top condition and we provide expert project management on tooling purchases, repairs and refurbishments. Sapona Plastics, LLC is a rapidly growing injection molding and assembly company located near Seagrove, NC, producing plastic products for the personal care, consumer goods, telecommunications, electrical, medical and automotive markets. The operation in Asheboro, NC encompasses 52,000 sq.ft. and the second plant in Seagrove, NC is 90,000 Sq.Ft. The business started in April 2004 and employs approximately 150 people. Processes include thermoplastic injection molding, insert molding, and over-molding. Primary products include lip balm containers, brushes, control and cable enclosures, filter components and a variety of other custom products. Secondary operations include assembly, labeling, decorating, spin welding, fusion welding, hot melt glue assembly, ultrasonic welding, foam filling, brush bristling and heat staking. Warehousing, distribution and fulfillment are offered from the both facilities near Interstate 73/74 and a short distance from I-40/I-85. Part and mold design project management service is provided with a network of local tool shops and international sources and in house CAD.